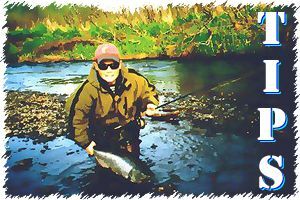 Alaska Flyfishing Online Tips - The Open Clinch Knot for Realistic Fly Movements! No one can deny that fly fishers are as loyal and enthusiastic about their sport as those who engage in shooting sports, archery, golf, or outdoor activities such as boating, mountain climbing, camping, and just about every thing else. The fly-fishing angler is often meticulous in his/her research and choice of the appropriate rod, reel, fly line, leader tippets, and fly patterns for each type of fishing conditions and species they seek. And they often choose the higher grade boots, fly vests, rain gear and other accessories. In other words, fly anglers love the sport and pay particular attention to a great many details in their hobby. Fly-fishing is a sport of knowledge, finesse, interpretation, and sometimes innovation. Presenting the fly just right can be a complicated combination of gear performance, weather and water conditions and physical skill. Yet too often many fly casters, and especially those just beginning to develop their expertise, overlook an important component that plays an integral part in the realistic presentation and motion of any sub-surface fly. Consider a waterlogged leaf in a stream as it flows with the current. You will see how it twists, turns, and changes depth as the major and subtle micro currents affect its progress and course downstream. Fish living in this environment are quite aware of these invisible currents. And nearly all of their food sources are equally affected by these nuances in stream flow. So its appropriate to assume, putting ourselves in the fish's place, that they are conditioned to seeing nymphs, crippled baitfish, and other foods being "tossed about" from the effects of these currents. But what is the secret to presenting the fly in the most natural way? A fly tied tight to a leader or tippet is significantly stifled in its movements during a downstream drift due to the stiffness of the monofilament. This is especially pronounced in Alaska fishing where larger fish require heavier tippets and these in turn inhibit the natural motion of the fly. In many Alaska fisheries where Catch and Release is the norm, fish can become quite fickle in what they will ultimately strike so the most natural presentation and motion of the fly can become that critical factor most important to angler success. The Open Clinch Knot is the obvious solution to this problem. It is easy to tie and allows the fly to swing freely on the leader and thus present itself with motion which more closely represents the currents which would affect a similar natural bait or food. Every fly fisher should use this knot for a majority of their fishing and especially for any subsurface patterns they fish. Dry flies and floating terrestrial patterns would be the exception to the rule since surface motion is a non-issue in these cases. Brad Hanson comments, "People are obsessed with creating realistic flies but they often times neglect the perspective of realistic behavior. Behavior is SO important to success and the Open Clinch, like any loop really adds a new dimension to the imitation. This is most important especially in Alaska where we use, on average, much larger, STIFFER tippets. Anglers will instantly grasp the concept and appreciate the tip."